In honor of World Cancer Day and the 18.1 million people around the world who were diagnosed with cancer this past year, we are republishing this piece from former CMMB volunteer and cancer survivor, Sama El Baz. 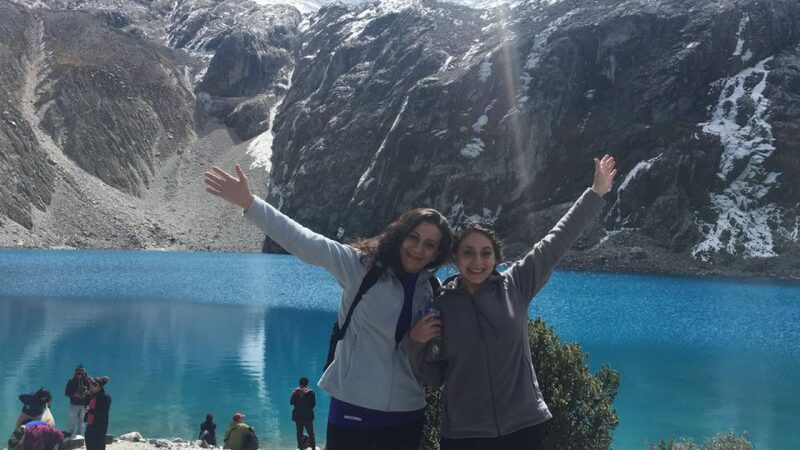 Sama volunteered with CMMB in Trujillo, Peru for a year and is now working in Mosul, Iraq as a mental health and psycho-social support project manager for people affected by recent violence and trauma. Learn why Sama believes cancer was a blessing in disguise for her. You never think it would be you. You never think it would be you sitting in a room with a surgeon and your parents, having your life flash before your eyes like they always say it does. You never think it would be you hearing that you have cancer – that your surgeon does not know what it is, how far it has spread or whether you would live or not. You never think it would be you, at 16 years old, days away from graduating high school, looking in the mirror trying to imagine yourself without any hair or eyebrows or eyelashes. And you never think it would be you, years later, thinking that if you had the chance to go back and changing your past, that you would choose to have cancer every single time. But then it happens. At least it did for me. Now despite cancer being an incredibly significant part of my life, teaching me the greatest lessons of overcoming difficulty through strength, cancer is not MY story. I can write pages and books on every not-great moment I endured throughout chemotherapy: the surgeries, the hair loss, the bouts of nausea, the tears. But cancer is only what brought me to the story. It is not THE story. As I was sat in a reclining chair, being injected with a red solution nicknamed ‘the red death’ and playing an intense game of backgammon with my older brother, I looked over to see who was having this debate and saw a young bald boy, about six or seven years old, hooked to an IV in a reclining chair next to me. While my reclining chair was completely taken up by just my body, his fit another tiny little human in it: his sister. After my final surgery with my biggest support system, my brother. The debate ended with both children agreeing on the Lion King. I watched stunned as these two children spent their day in the infusion room of a hospital, enjoying this classic together. I remember in that moment, looking at my brother who was there with me – like he was for every single ten-hour chemo session – thinking how blessed we were not to have gone through this during our childhood. As a child, I went to birthday parties, to school, and to swimming practice, I wrestled with my brother, rode bikes around the block with my neighbors, and occasionally went to the doctor’s office for my annual bout of strep throat. I never once, as a child, sat in a reclining chair with my brother, worried about whether he’d live or not. I never once looked at his thick curly hair, falling out, lock by lock. I never once worried about my brother’s white blood cell count or wore a mask to get to sit next to him. It was in that moment, hooked up to an IV, nauseated and bald, that I realized how good my life was. I had cancer, I was fragile, I couldn’t look my mother in the eyes without seeing her sadness, I couldn’t remember what it was like to not be in pain, but I was the luckiest person in the world. For me, the pain of chemotherapy was nothing like the pain I felt every time I entered the oncology/hematology department and saw the children. While the chemo hurt every bone in my body, seeing these young children hurt every part of my heart. And it was in those difficult moments in the infusion rooms surrounded by sick children that I decided that I would spend the rest of my life doing everything in my power to prevent children from getting sick. Having had cancer the summer before I began college was not a coincidence, as nothing ever is. I finished chemotherapy ten days before I started studying Community Health, knowing immediately that I wanted to help children in the most vulnerable of situations receive access to quality healthcare. After multiple internships and experiences abroad I knew that working for an international health NGO dedicated to vulnerable children and women was where I belonged. Excited to wear my survivor shirt at a Leukemia and Lymphoma walk! It was nearly a year ago that I started my journey with CMMB and my time volunteering in Peru. And what a journey it has been. To be volunteering in Peru, working on a project committed to preventing anemia and improving nutrition through education, I look back and realize that everything that has happened, every single moment, was leading me to where I am now. And for that, I am extremely blessed. As cliché as it may sound, I genuinely believe that everything happens for a reason. Every second, every ache, every hardship in my life has been significant – a constant construction, a precise placement of the building blocks of what I call ‘my life.’ I said before that cancer wasn’t my story, and it isn’t. The beautiful children of the world are my story; their health, their childhood and their lives are “my story” – and that is why I am a volunteer.